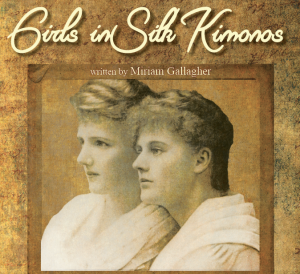 On Wednesday 30 January 2019 the National Library of Ireland, Merrion Square West, Dublin 2, in association with Dublin Lyric, hosted a performance of the late Miriam Gallagher’s play Girls in Silk Kimonos. Originally written for radio, the play centres on the correspondence between Constance Markievicz and her sister Eva Gore-Booth, focusing on Constance’s election to Westminster in December 1918. The acting team was Mia Gallagher and Una McNulty in the roles of Constance and Eva respectively; and Declan Brennan in the role of narrator. The reading was directed by Conor O’Malley and music wass provided by Ciaran Tourish of Áltan. After the performance, director Conor O’Malley will lead a discussion with members of the audience. The performance took place at 7pm in the Mezzanine Room of the National Library and was supported by the Commemoration Unit of the Department of Culture, Heritage and the Gaeltacht. Listen back to an interview with Mia Gallagher and Conor O’Malley from RTÉ Radio’s Arena.